On 7 May this year, after hitting milestones for the longest stretch of freezing temps, fastest/thickest ice cover, and third snowiest winter (so far), the Port of Duluth-Superior was preparing to finally welcome its very first oceangoing ship of the 2014 commercial shipping season that night — the first saltie to have made a full transit of the 2,342-mile Great Lakes–St. Lawrence Seaway. The Diana, which flies the flag of Antigua and Barbuda, was expected to arrive at about 8pm on 7 May, having been delayed by ice transiting Lake Superior. The ship was expected to sail in beneath Duluth’s Aerial Bridge then proceed directly to the CHS grain elevator in Superior. “We witnessed the earliest arrival on record for a first saltie of the season last year: 30 March 2013. This year, we’re a week into May and just hitting that milestone,” said Adele Yorde, PR Manager for the Duluth Seaway Port Authority. “While this will go down as the latest on record, the ice- encrusted start to the season can’t dampen enthusiasm here in the Twin Ports.” Boat watchers were expected to head to the Duluth ship canal to wave and take photos as the first saltie sails in. And the maritime community was set to gather for an official, invitation-only First Ship Ceremony aboard the ship at CHS. The Diana began her voyage by discharging cargo in Santos, Brazil, before proceeding to the Twin Ports. The 138m ship will load approximately 11,550 metric tonnes of wheat at the CHS elevator before departing for Algeria. on the Great Lakes, there are another half-dozen salties queued up and headed to Duluth–Superior to load wheat and beet pulp pellets during the following week. 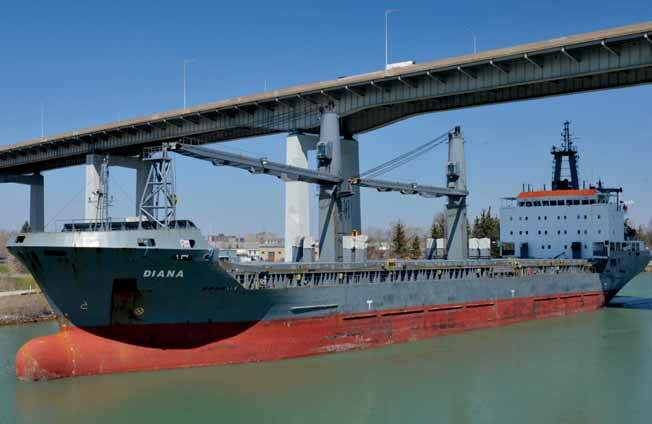 Historical Note: Until this week, the latest arrival of this port’s first saltie had been 3 May, which happened in 1959 when the Ramon de Larrinaga arrived in Duluth — the very first saltie to have transited the St. Lawrence Seaway after it opened that year. Close to 1,000 ships visit the Port of Duluth-Superior each year, moving roughly 40mt of cargo — iron ore, coal, grain, limestone, cement, salt, plus project cargo and more. As the largest tonnage port on the Great Lakes-Seaway, cargo movements through the Port of Duluth-Superior support 11,500 jobs and contribute over $1.5 billion in business revenues to the local/regional economy.